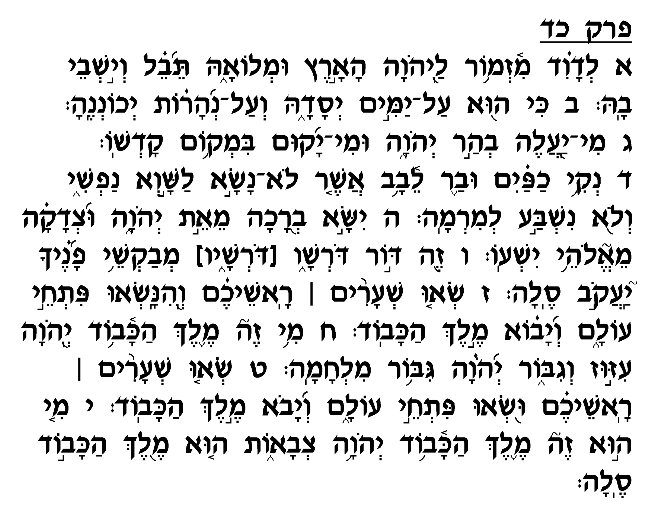 Several commentators, including Rashi, Ibn Ezra and Radak (verse 7), record the tradition that David composed this Psalm for the occasion of bringing the Aron (ark) into the Beit Ha'mikdash, an event that took place after his death, during the reign of his son, Shelomo. According to Ibn Ezra and Radak, David wrote this chapter when the site of the <?xml:namespace prefix = st1 ns = "urn:schemas-microsoft-com:office:smarttags" />Temple was revealed. As we read in the Book of Divrei Hayamim I (22:1; see also the final verses of the Book of Shemuel II), God visited a plague upon Benei Yisrael towards the end of David's reign, and the plague was halted at the future site of the Mikdash. David purchased that site, constructed an altar, offered sacrifices, and declared that this area was destined to serve as the site of the Beit Ha'mikdash. It was at that point, the commentators write, that David composed this Psalm with the intent that it be sung when the ark is brought into the Temple to mark God's taking residence, as it were, at that site. David begins this chapter by affirming the belief in God as Creator of the universe, and then proceeds to describe the unique status of holiness God conferred upon Mount Moriah, the site of the Beit Ha'mikdash. David declares that only the moral and upright are worthy of ascending to the sacred site and receiving the special blessings associated with it. In the Psalm's final verses (7-10), David orders the gates of the Temple to open to allow the Almighty to enter and take residence, so-to-speak, in its midst. Why does David begin this Psalm by affirming the belief in God as Creator? Of what relevance is this belief to the designation of Mount Moriah as the site of the Mikdash? The Radak (verse 1) explains that David seeks to draw a contrast between this site and the rest of the world. The world generally was created for all mankind; the earth's resources are accessible to anyone. Not so the sacred site of the Temple, which, as David here proclaims, is reserved for those who are honest and upright. While it may be possible for unscrupulous and dishonest men to enjoy the physical and material delights of the world, the earth's spiritual blessings are available only to those who live lives of integrity and holiness. This Psalm is recited on a number of instances during our prayer service. As it opens with a reference to creation, this chapter was chosen as the "Shir Shel Yom" – the daily Psalm – for Sunday, the day on which the process of creation began. Ashkenazic congregations recite this chapter as well when returning the Torah to the ark in the synagogue, which corresponds to the bringing of the Aron to the Mikdash, the occasion for which this Psalm was composed.